Ga.Scoigne (George), an old English poet of considerable merit, was born of an ancient ‘and honourable family in Essex, and was son and heir of sir John Gascoigne, who, for some reason not assigned by his biographer, Whetstone, chose to disinherit him. Previously 10 this harsh step, he had been privately educated under a clergyman of the name of Nevinson, perhaps Stephen Nevinson, LL. D. prebendary, and commissary of the city and diocese of Canterbury. After this he was removed, either to Oxford or Cambridge. 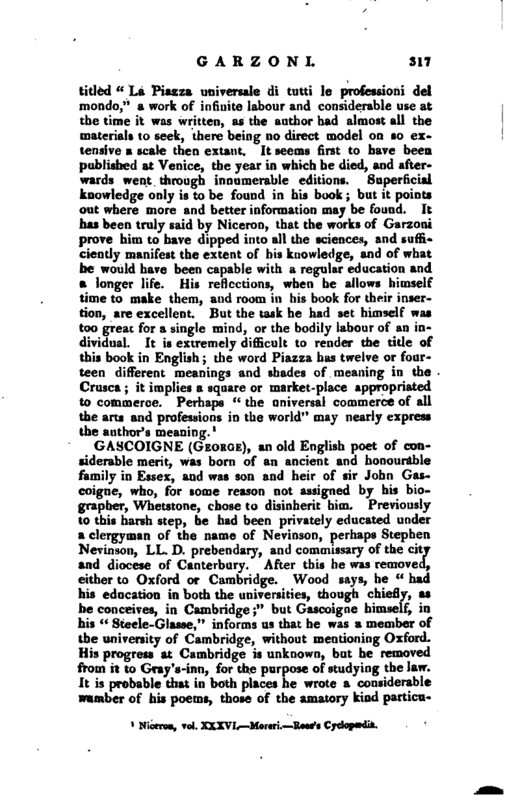 Wood says, he “had his education in both the universities, though chiefly, as he conceives, in Cambridge;” but Gascoigne himself, in his “Steele-Glasse,” informs us that he was a member of the university of Cambridge, without mentioning Oxford. His progress at Cambridge is unknown, but he removed from it to Gray’s-inn, for the purpose of studying the law. It is probable that in both places he wrote a considerable number of his poems, those of the amatory kind particu1 Niceron, vol. XXXVI. Moreri. Raes’s Cyclopedia. | larly, as he seems to include them among his youthful follies. Wood now informs us, that Gascoigne “having a rambling and unfixed head, left Gray’s-inn, went to various cities in Holland, and became a soldier of note, which he afterwards professed as much, or more, as learning, and therefore made him take this motto, Tarn Marti quam Mercurio. From thence he went to France to visit ’the fashions of the royal court there, where he fell in love with a Scottish dame.” In this there is a mixture of truth and error. The story of the Scottish dame has no better foundation than some lines in his “Herbes,” written probably in an assumed character. His being in France is yet more doubtful, and perhaps the following is nearly the fact. While at Gray’s-inn, he incurred the expences of a fashionable and courtly life, and was obliged to sell his patrimony, whatever that might be, and it would appear that his father, dissatisfied with his extravagance, refused him any farther assistance, and probably about this, disinherited him. Without blaming his father, farther than by calling his disinheritance “a froward deed,” he now resolved to assume the airs of independence, in hopes that his courtly friends would render him in reality independent; but he soon found that their favours were not to be obtained without solicitations incompatible with a proud spirit. A more honourable resource then presented itself. William prince of Orange was at this time endeavouring to emancipate the Netherlands from the tyranny of the Spanish monarch, and Gascoigne, prompted by the hope of gaining laurels in a field digntfied by patriotic bravery, embarked on the 19th of March, 1572, for Holland. The vessel being under the guidance of a drunken Dutch pilot, was run aground, and twenty of the crew who had taken to the long-boat were drowned. 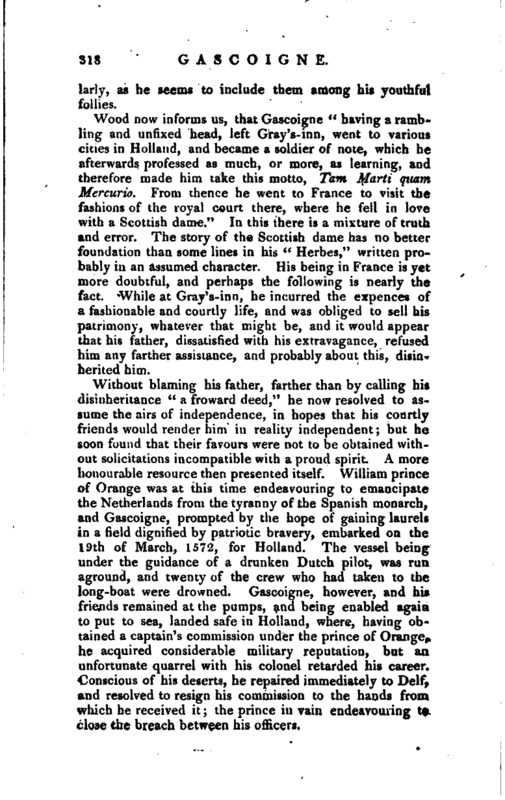 Gascoigne, however, and his friends remained at the pumps, and being enabled again to put to sea, landed safe in Holland, where, having obtained a captain’s commission under the prince of Orange, he acquired considerable military reputation, but an unfortunate quarrel with his colonel retarded his career. Conscious of his deserts, he repaired immediately to Delf, and resolved to resign his commission to the hands from which he received it; the prince in vain endeavouring to close the breach between his officers. | During this negociation a circumstance occurred which had nearly- cost our poet his life. A lady at the Hague (then in the possession of the enemy) with whom Gascoigne had been on intimate terms, had his portrait in her hands, and resolving to part with it to himself alone, wrote a letter to him on the subject, which fell into the hands of his enemies in the camp; from this paper they meant to have raised a report unfavourable to his loyalty: but upon its reaching his hands, Gascoigne, conscious of his fidelity, laid it immediately before the prince, who saw through their design, and gave him passports for visiting the lady at the Hague: the burghers, however, watched his motions with malicious caution, and he was cabled in derision “the Green Knight.” Although disgusted with the ingratitude of those on whose side he fought, Gascoigne still retained his commission, till the prince coming personally to the siege of Middleburg, gave him an opportunity of displaying his zeal and courage, and rewarded him with 300 gilders beyond his regular pay, and a promise of future promotion. 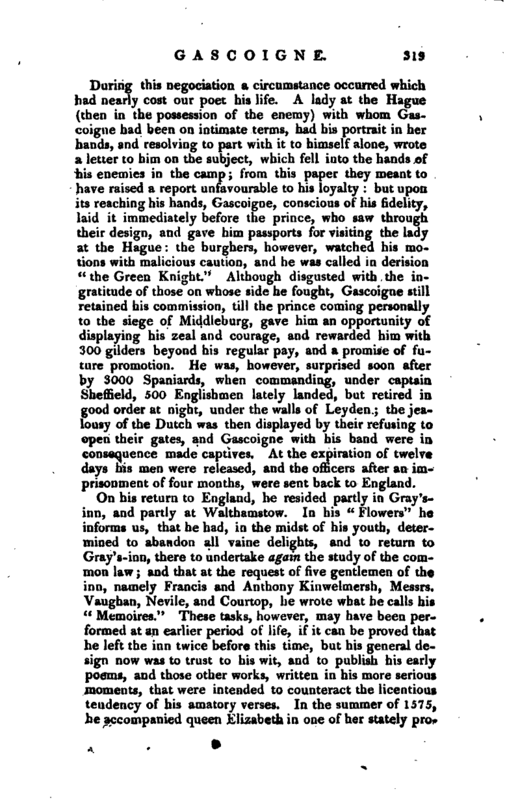 He was, however, surprised soon after by 3000 Spaniards, when commanding, under captain Sheffield, 500 Englishmen lately landed, but retired in good order at night, under the walls of Leyden; the jealousy of the Dutch was then displayed by their refusing to open their gates, and Gascoigne with his band were in consequence made captives. At the expiration of twelve days his men were released, and the officers after an imprisonment of four months, were sent back to England. On his return to England, he resided partly in Gray’sinn, and partly at Walthamstow. In his “Flowers” he informs us, that he had, in the midst of his youth, determined to abandon all vaine delights, and to return to Gray’s-inn, there to undertake again the study of the common law; and that at the request of five gentlemen of the inn, namely Francis and Anthony Kinwelmersh, Messrs. Vaughan, Nevile, and Courtop, he wrote what he calls his “Memoires.” These tasks, however, may have been performed at an earlier period of life, if it can be proved that he left the inn twice before this time, but his general design now was to trust to his wit, and to publish his early poems, and those other works, written in his more serious moments, that were intended to counteract the licentious tendency of his amatory verses. In the summer of 1575, he accompanied queen Elizabeth in one of her stately | progresses, and wrote for her amusement, in the month of July, a kind of mask, entitled “The Princely Pleasures of Kenelworth Castle.” Some of the verses were not only written, but spoken by him on this occasion; but the whole of the entertainment, owing to the unfavourable weather, was not performed. On his return from this progress, his principal residence, while preparing his works, was at Waltliamstow. Here it appears, by Whetstone’s account, he wrote the “Steele Glasse,” the “Glass of Government,” the “Delicate Diet,” a book of hunting, and the “Doom’s Day Drum,” which last was not published until after his death. He left other pieces behind him, some of which were afterwards printed in various collections, but without his name. 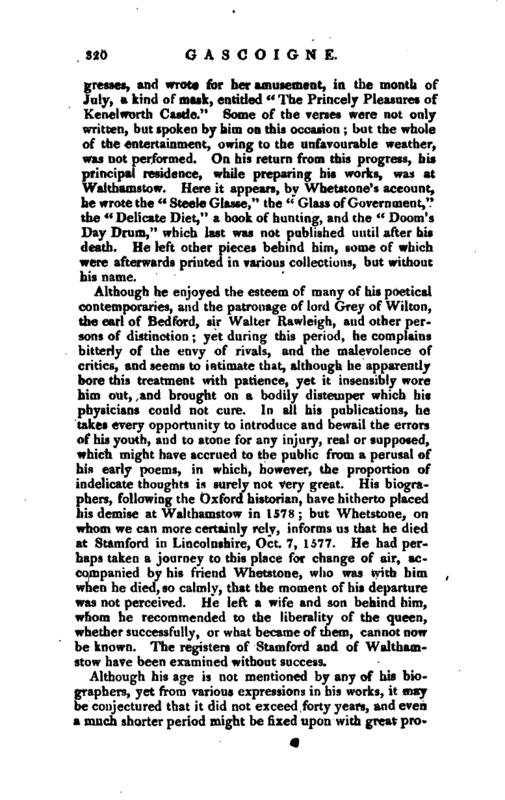 Although he enjoyed the esteem of many of his poetical contemporaries, and the patronage of lord Grey of Wilton, the earl of Bedford, sir Walter Rawleigh, and other persons of distinction; yet during this period, he complains bitterly of the envy of rivals, and the malevolence of critics, and seems to intimate that, although he apparently bore this treatment with patience, yet it insensibly wore him out, and brought on a bodily distemper which his physicians could not cure. 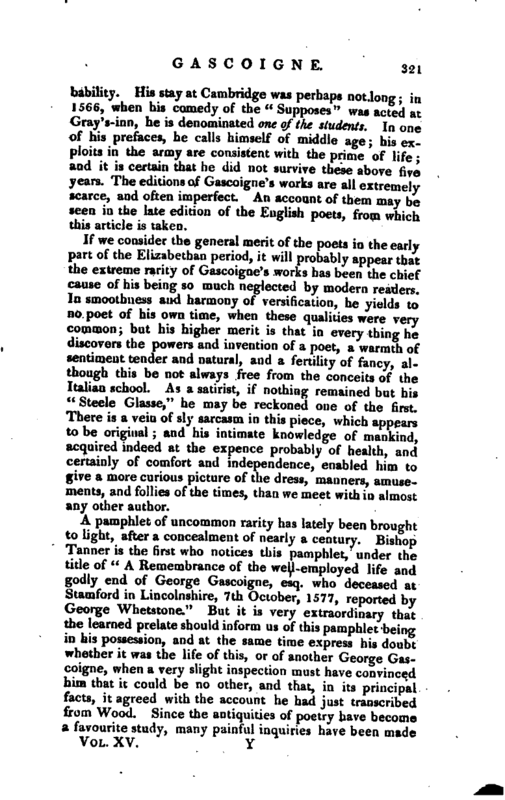 In all his publications, he takes every opportunity to introduce and bewail the errors of his youth, and to atone for any injury, real or supposed, which might have accrued to the public from a perusal of his early poems, in which, however, the proportion of indelicate thoughts is surely not very great. His biographers, following the Oxford historian, have hitherto placed his demise at Walthamstow in 1578; but Whetstone, on whom we can more certainly rely, informs us that he died at Stamford in Lincolnshire, Oct. 7, 1577. He had perhaps taken a journey to this place for change of air, accompanied by his friend Whetstone, who was with him when he died, so calmly, that the moment of his departure was not perceived. He left a wife and son behind him, whom he recommended to the liberality of the queen, whether successfully, or what became of them, cannot now be known. The registers of Stamford and of Walthamstow have been examined without success. Although his age is not mentioned by any of his biographers, yet from various expressions in his works, it may be conjectured that it did not exceed forty years, and even a much shorter period might be fixed upon with great | probability. His stay at Cambridge was perhaps not long; in 1566, when his comedy of the “Supposes” was acted at Gray’s-inn, he is denominated one of the students. In one of his prefaces, he calls himself of middle age; his exploits in the army are consistent with the prime of life; and it is certain that he did not survive these above five years. The editions of Gascoigne’s works are all extremely scarce, and often imperfect. An account of them may be seen in the late edition of the English poets, from which this article is taken. If we consider the general merit of the poets in the early part of the Elizabethan period, it will probably appear that the extreme rarity of Gascoigne’s works has been the chief cause of his being so much neglected by modern readers. 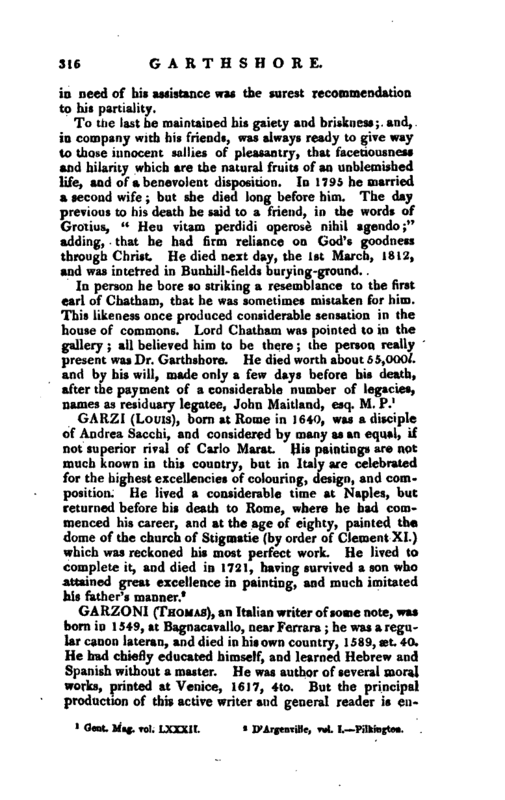 In smoothness and harmony of versification, he yields to no poet of his own time, when these qualities were very common; but his higher merit is that in every thing he discovers the powers and invention of a poet, a warmth of sentiment tender and natural, and a fertility of fancy, although this be not always free from the conceits of the Italian school. As a satirist, if nothing remained but his “Steele Glasse,” he may be reckoned one of the first. 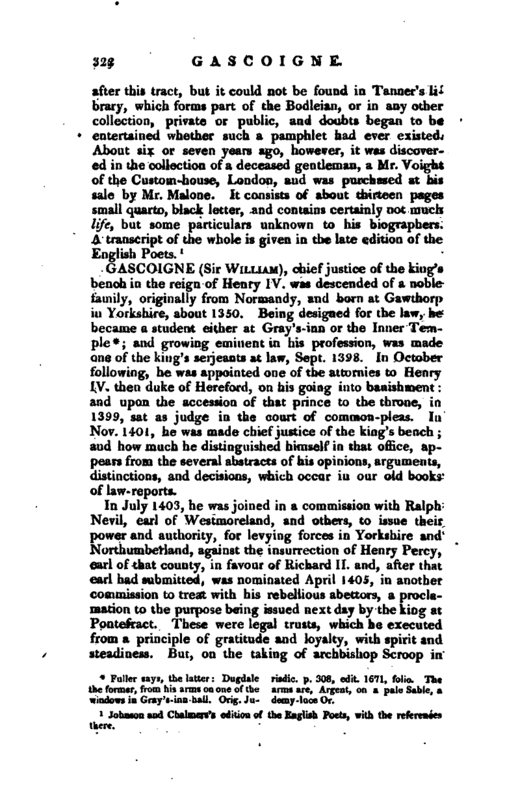 There is a vein of sly sarcasm in this piece, which appears to be original; and his intimate knowledge of mankind, acquired indeed at the expence probably of health, and certainly of comfort and independence, enabled him to give a more curious picture of the dress, manners, amusements, and follies of the times, than we meet with in almost any other author. 1 Johnson and Chalmers’s edition of the English Poets, with the referencor there.